Dim the lights and place battery-operated candles on table tops. 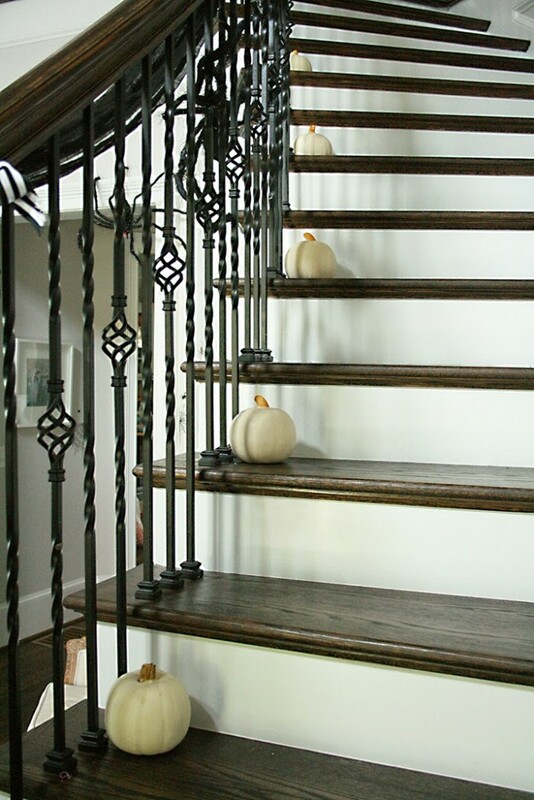 Flame candles should be placed high above on a stable table or shelf that won’t cause any obstruction. Ask guests to bring a Halloween-themed dish. You’ll be surprised how many people get into it, like the skull meat and cheese tray below! Take black dry eraser marker and write scary words or quote Edgar Allan Poe on a large mirror. This always catches guest’s eyes and have them questioning what it says. 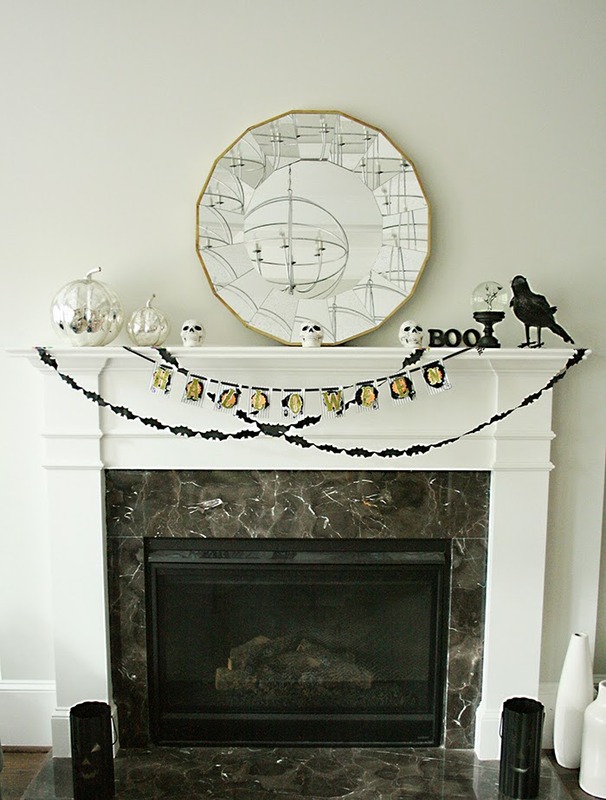 Spray paint a twig wreath black and then hot glue black fake leaves and snakes, skulls or tiny mice. This is the first year that I am actually throwing a Halloween party. The past few years I’ve planned our neighborhood Halloween party but it’s usually for the neighborhood kids and all outdoor games like cake walk, donut on a string, mummy bowling. But this year is my first Halloween adult costume party so I am excited. 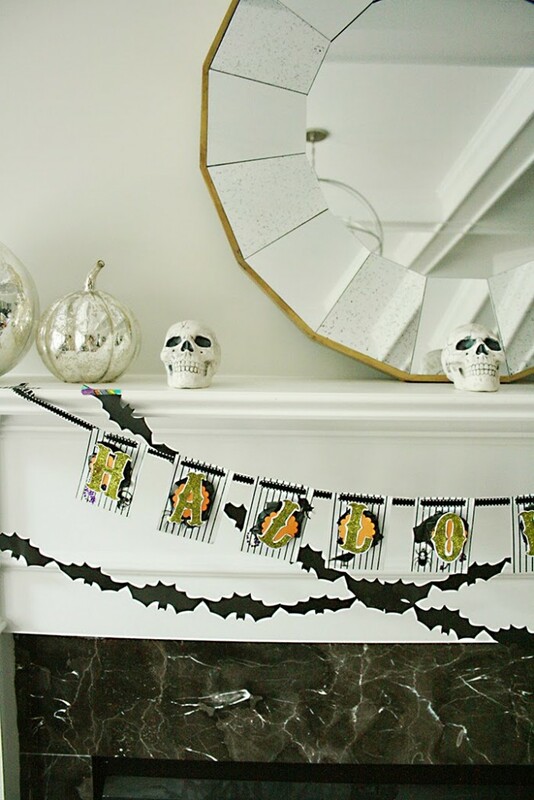 There are so many decorating options, but I wanted to do easy Halloween decorations to keep money cost down and also not to make everything look so cluttered and over the top. Halloween can do that! Many of my Halloween decorations were broken from not being stored properly (oops!) but most were still in good conditions like my Halloween glass cloches. But really I didn’t have as many decorations as I thought I did, so many brain was thinking how to keep costs down but set up easy Halloween decorations. 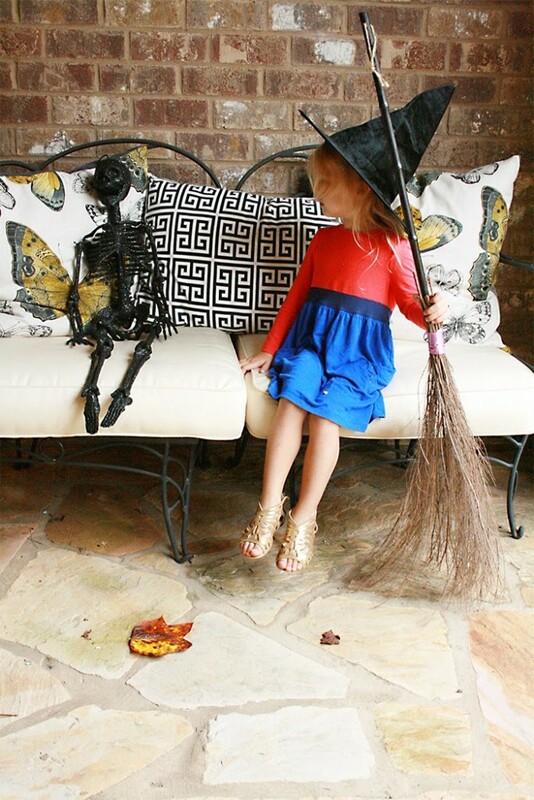 Here are a few easy Halloween decorations ideas I came up with. The party is this weekend so many of the decorations I am setting up the day of the party, but this is kind of an idea of what we have currently set up in the house. Decorate with candles. I am planning to have flameless and some real candles all around the house on the day of the party. Turn the lights down and let the spooks come out. Use white flat sheets to cover furniture. This will make the room appear instantly neglected. Add “moth-eaten” or cheese cloth to curtains for the perfect finishing touch. 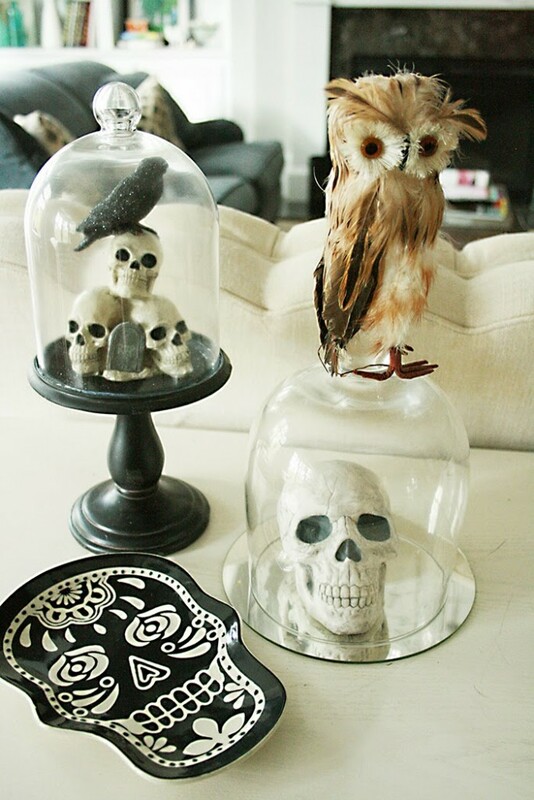 Spray paint glass bottles black, and add white candles for a cheap and easy Halloween decoration for your table centerpiece. The white wax will melt on the black bottles creating antique affect. Spray paint branches black and add dead flowers for another cheap and easy Halloween centerpiece. Add Spanish moss to the bottom of the urn and fake Skeleton heads from the dollar store. 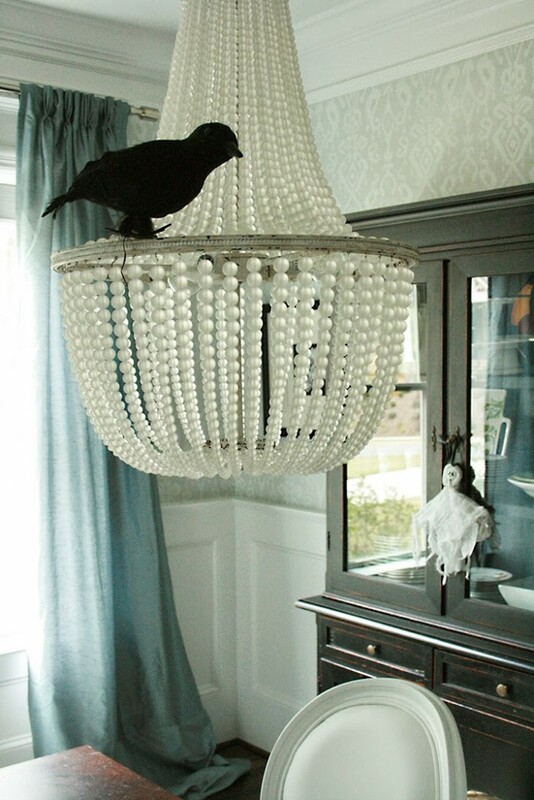 Take black cheesecloth sheets from the dollar store and cover over chandeliers and tabletops to create a creepy room that is a sure sign that ghouls have taken over. 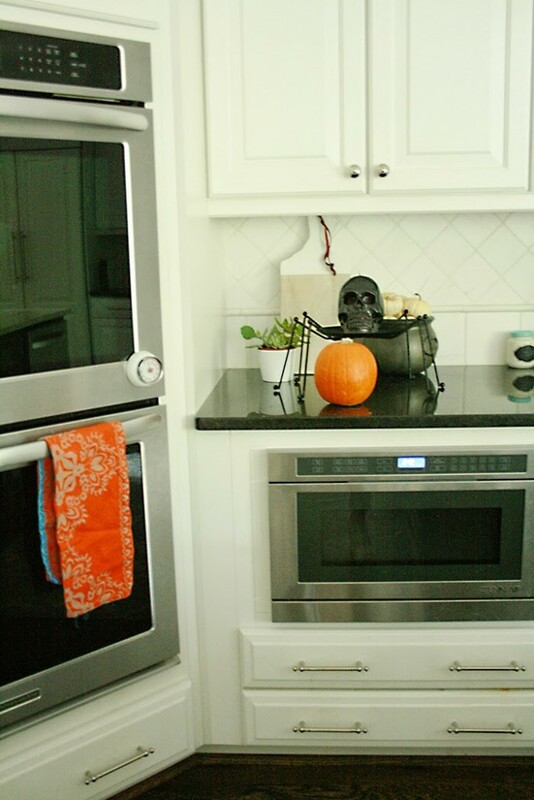 Take heavy duty black garbage bag and with scissors cut vertical strips from the bottom and stopping a few inches from the top to make a tattered, twisted curtain. 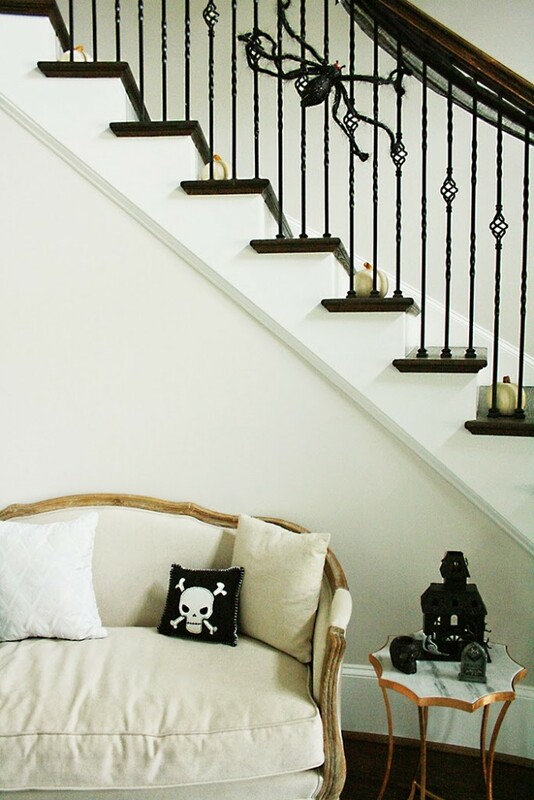 Hang from a room entrance for a haunting entrance. 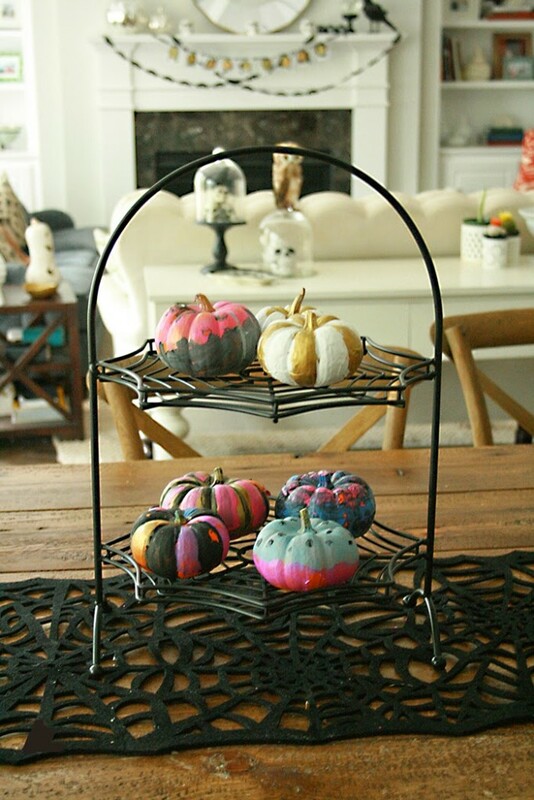 Have fun decorating with spider webs. 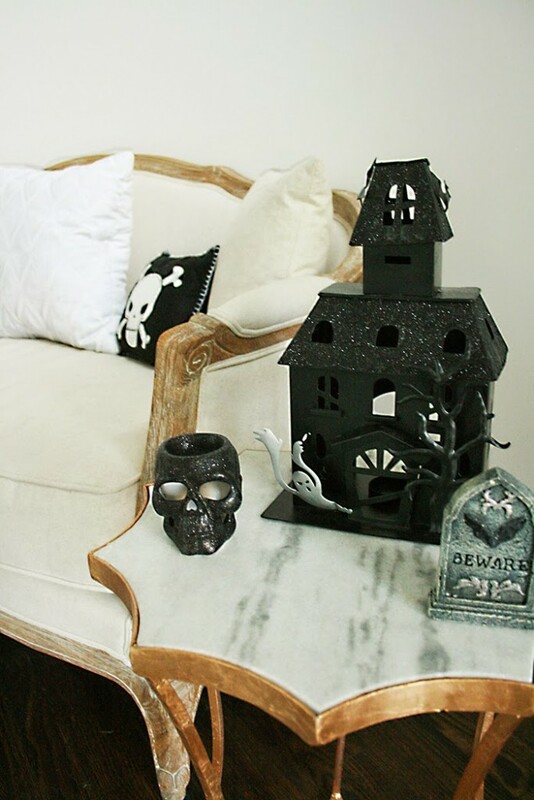 They are cheap and easy to spookify a room! Add little plastic spiders. Halloween has arrived at our house. We are in full swing festivities! 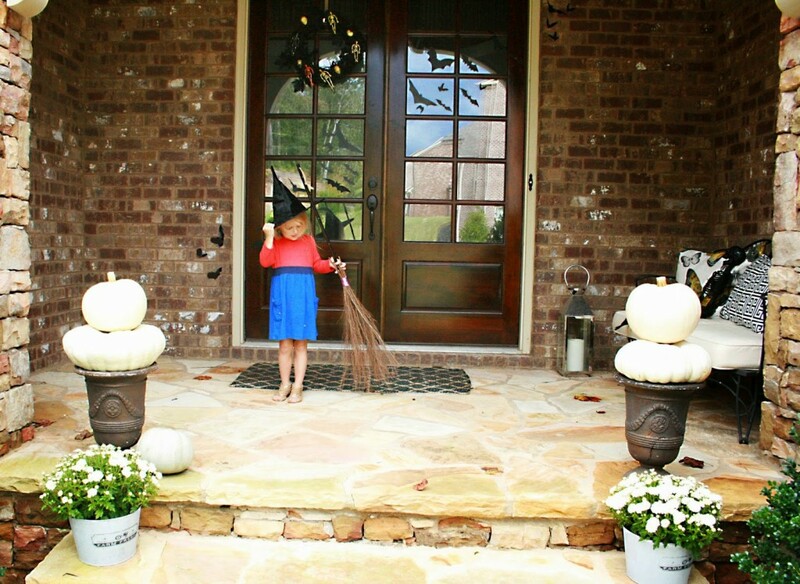 The kids have boo’d almost the entire neighborhood…everyday. I have now explained to them the difference between boo’ing and doorbell ditching. (Want to boo someone? 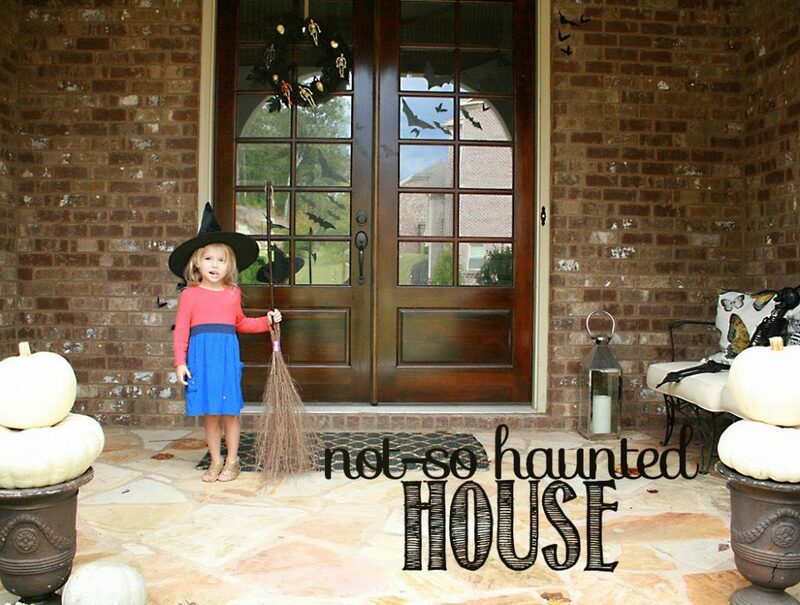 Here is a cute boo printable). My Stella is sewing like a mad lady making Halloween costumes. She’s going to be a pro after this holiday. We’ve got spooky, creepy crawlies climbing up my walls. And lot’s of black around the house. Pumpkin seems to be in our daily diet. I think we are set! Here are some of our past Halloween house decor. Thank you for signing up on our Newsletter! Hello and welcome to my creative space! I'm Darleen…creator, designer, DIYer, healthy eater, party planner and mother of 4. Oh and one lucky wife! This lifestyle blog is where I share what I am currently up too and inspired by. Thanks for stopping by! FREE April Calendar for you to download for personal use! Hosting Easter? Check out our inspired Easter tables. Cleaning out the Jewelry Box! New spring sale items discounted up to 30% of! All images and content, unless otherwise stated, are property of Darleen Meier. They are not to be reproduced for individual or commercial purposes. Please do not use any of my images without proper links back to my site. Darling Darleen also contains affiliate marketing links. This means that when you click links or purchase items, I may receive a small commission for the referral. I only post and recommend links from companies and brands that I love, so please know that you are in good hands. Thank you so much for your support! 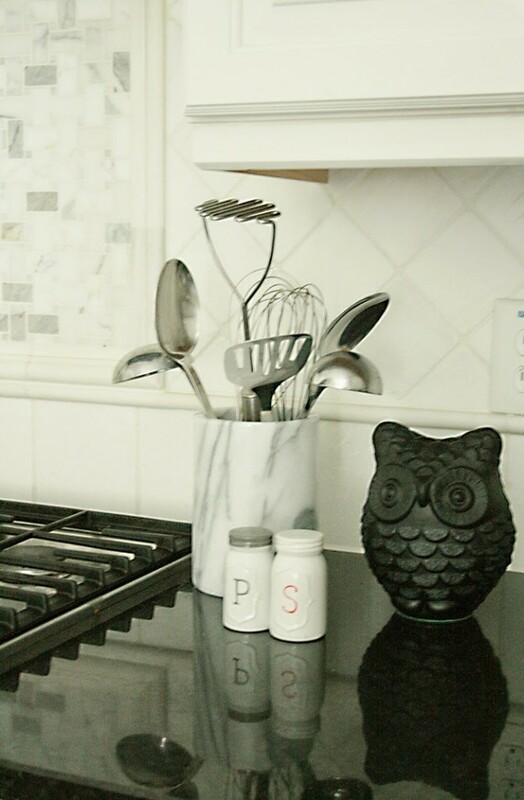 © 2019 Darling Darleen | A Lifestyle Design Blog . Site Design by Pish and Posh Design Studio.